Homeowners have many options to consider when selecting the right color for their roof. With metal roofing, choosing the right color can make a difference in energy efficiency, costs, and overall savings. 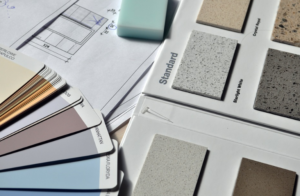 Additionally, homeowners want a color that augments the overall aesthetic feel and curb appeal of their home. There are many choices to consider when selecting the correct color and style for your roof. What are the best options for your home? Your choice of roof color plays a surprisingly large role in overall energy efficiency and savings. Be sure to research the different quality of paint. For example, high-end Kynar 500 white for metal roofing is Energy Star approved and considered a “Cool” roof. It will be significantly cooler than traditional black asphalt shingles, making it absolutely ideal for tropical warm climates. What if you live in a cooler climate? Choose a darker color like black, dark grays, dark browns, and even deep greens. The darker colors absorb the heat. The extra heat transfers to any of the rooms in the home directly under the roof. This reduces heating costs considerably. If you are concerned about extra heat during the summer, opt for a more neutral color like a green, blue, or lighter gray. Dark roofs absorb excess heat, which means that they are ideal for snowy regions. The heat of the metal roofs will melt the snow. This means that dark roofs remain popular in northern regions. Be sure that you have good attic insulation and good roof ventilation to further enhance the benefits of a dark roof. Finally, take into consideration the quality of the paint that you choose. A high-quality paint can meet your energy efficiency standards regardless of the color or climate. The paint should be treated for ultraviolet sun exposure, otherwise fading and wear can result. Some sealants will further protect the home from unwanted mildew and moisture. Some quality brands are Hylar 5000, Kynar 500, or Energy Star brands. Choose the right color for your home. Be sure that it is both energy efficient and is a color that you love.